Loans claimed the greatest market share, despite slower growth from leading loan provider Mosaic. Solar loans emerged as the dominant financing solution for residential systems in the first half of 2018, as existing loan providers scaled up through major installer partnerships and new loan providers grew via relationships with regional installers, according to the latest U.S. residential solar finance report from Wood Mackenzie. 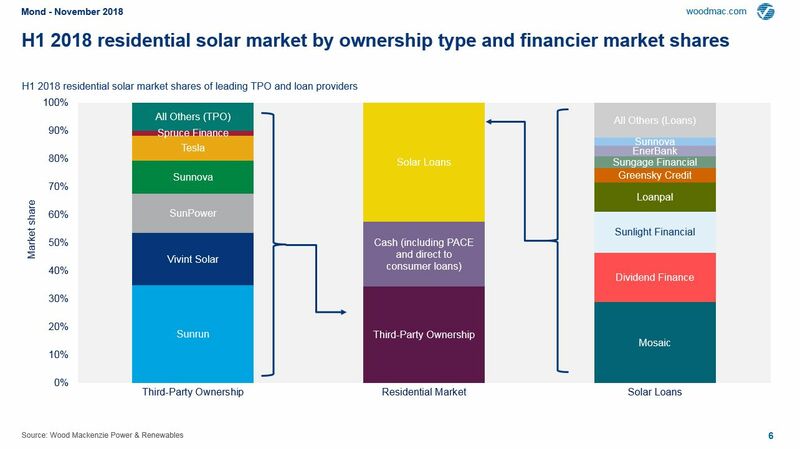 Loans claimed a 42 percent share of the residential market, outperforming third-party-owned solar sales for the first time since WoodMac (formerly GTM Research) began tracking the solar finance space. Third-party ownership (TPO) reached its lowest point in the first half of 2018 since 2011, with a 34 percent market share. The recent decline in leases and PPAs relative to other financing options has leveled off, however. The report cites several key reasons for this: 1) Slowed growth for loan provider Mosaic, 2) resumption of TPO sales growth from Vivint Solar, and 3) continued growth from Sunrun. Leading loan provider Mosaic saw its growth slow slightly in H1 as the company shifted focus to targeting more profitable sales. Mosaic maintained its rank as the top U.S. solar loan provider, with a 29 percent share of the customer-owned market, and just barely beat out Sunrun in overall deployments over the period. But Mosaic’s more moderate growth enabled TPO systems to regain some market share. While Mosaic may be giving up some sales in the short term, this approach will help to ensure success in the long term, said Mond. Most other loan providers are focused on achieving growth at all costs, which made loans the dominant solar financing product in H1. But Mond expects those companies will eventually have to restructure, too. “The day is going to come when these companies are forced to increase pricing or potentially go out of business because they aren’t making any money,” she said. 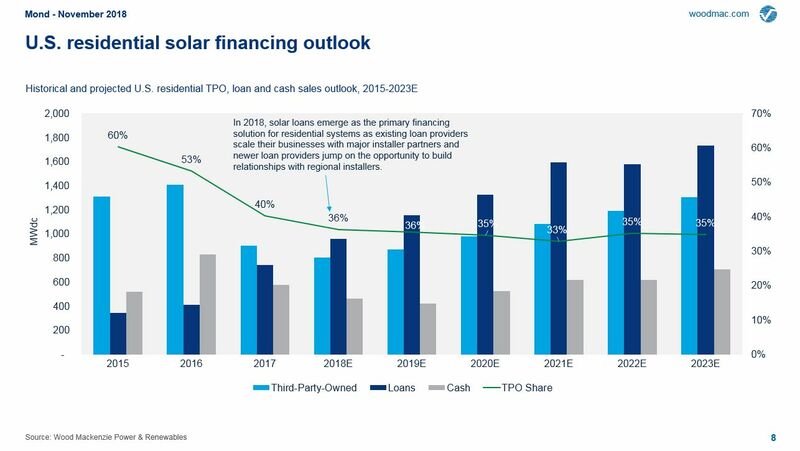 The solar loan market today resembles the situation large TPO providers were in a year ago, according to Mond. Most TPO providers still aren’t profitable, but after restructuring, they’re at least able to generate enough cash to keep on growing. Vivint Solar is an example of this. The company saw installations stall in 2017 as it reoriented toward profitability. This year, Vivint resumed growth and has renewed its focus on TPO sales, according to WoodMac. The third key element keeping TPO sales from slipping further in terms of market share is that Sunrun continues to see lease sales grow through its vertically integrated installation business. Tesla continued to retreat from the residential solar scene over the course of this year. The company deployed 160 megawatts of solar through the first half of 2018, and 93 megawatts of solar in the third quarter of 2018, which represents a slight uptick. But a large portion of those installations are believed to have been commercial sales, as opposed to residential, given that Tesla has shut down several of its sales channels. Tesla ceased door-to-door sales in 2017 and ended its partnership with Home Depot in June, leaving its website and stores as its primary sales vehicles. Looking further into the future, WoodMac expects loan sales to maintain a lead over TPO systems, although the most recent forecast was adjusted slightly to reflect recent changes to the federal Investment Tax Credit (ITC) guidance. 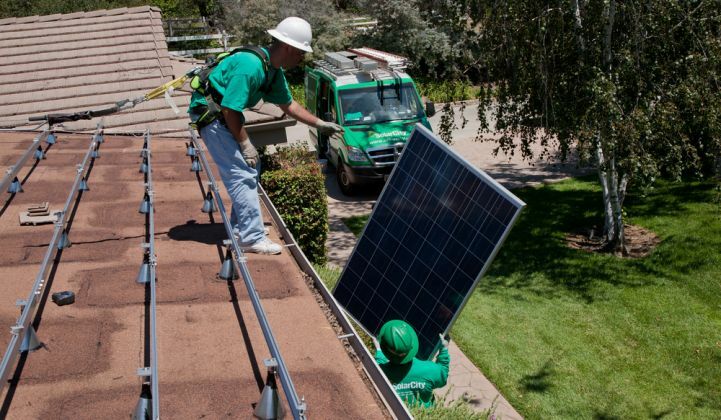 Under the new rules, released in June, customer-owned residential solar systems see the tax credit disappear in 2022, while TPO systems can still claim a 10 percent credit at that time. 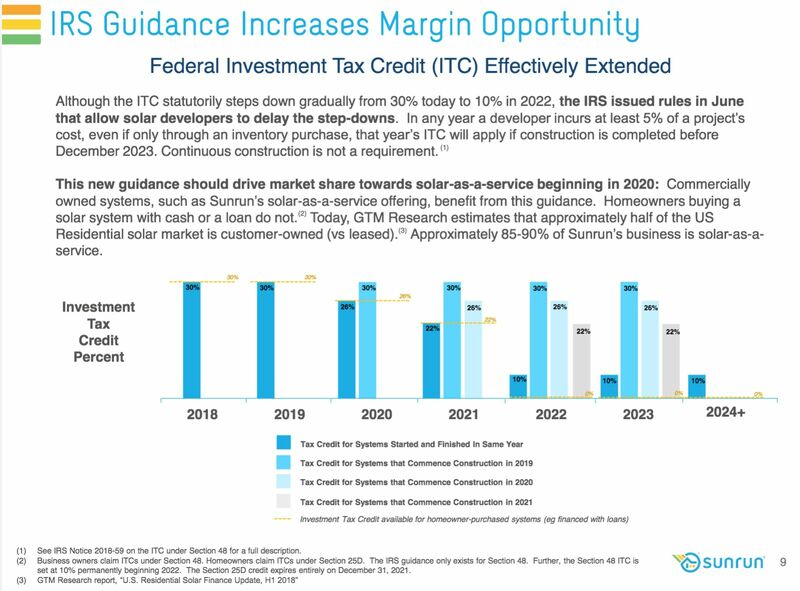 Also, under new “commence-construction” rules, residential solar installers can claim the tax credit for a given year by investing at least 5 percent of the total system cost in that year. That means companies with enough cash to buy equipment early will be able to claim a higher tax credit, even if the systems aren’t installed until the following year. Sunrun views this is as a significant opportunity for its lease business. According to WoodMac, the ITC will have a limited effect on the TPO market overall. The tax guidance will provide an advantage to TPO providers over the next few years, said Mond. But not enough of an advantage for leases and power-purchase agreements to claim a greater market share than loans. WoodMac projects customer-owned systems will see their growth rate fall by 1 percent in 2022, compared to the previous forecast, because they won't look as competitive as TPO systems. But the growth rate decline is limited to 1 percent because of the resilience of customer-owned demand, said Mond. "You’ll have people who just want to own their system," she said. "And even without the ITC, the loans make the payments a lot easier. So maybe [customers] won't be saving as much as with leases or PPAs, but customers might still see savings each month or year with a loan. And they'll know that once it's paid off, that’s just free electricity from that point." "I do believe there will always be a market for that," she added. The report is available for puchase here. Wood Mackenzie clients can download it here.